Barcelona: Lionel Messi-less Barcelona demolished Real Madrid 5-1 in Sunday's El Clasico at Camp Nou with Luis Suarez scoring a hat-trick. This was the first El Clasico contest in 11 years without Messi and Cristiano Ronaldo, who has moved to Juventus. The injured Messi was at the stadium and celebrated the win along with fans. The big loss has put more pressure on Real coach Julen Lopetegui with the local media reporting that he is set to be sacked. With Sunday's victory, Barcelona sit on top of the La Liga table with 21 points. Real are languishing at ninth with 14 points from four wins, two draws and four losses. Barring 30 minutes into the second half, it was one-way traffic with Barcelona dominating the proceedings. Philippe Coutinho opened the account and Arturo Vidal scored the fifth and final goal for Barca with Suarez netting a hat-trick in between. 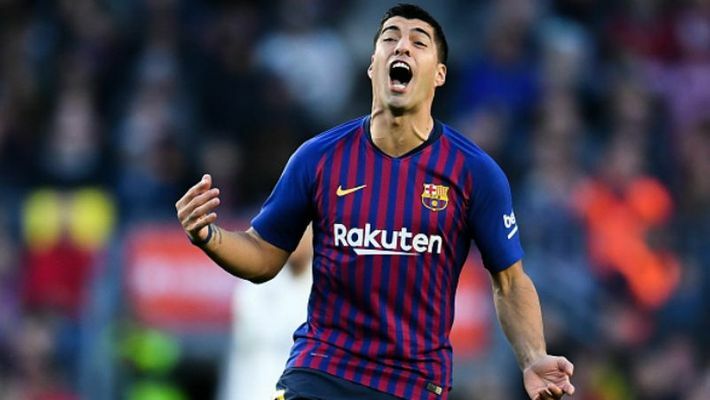 Hat-trick hero Suarez said, "We are very proud to have the best player in the world (Messi) on our team," and added, "we showed that we are a great team and that we have a great coach." "It's a great achievement to win 5-1 without Messi," Sergio Busquets told the club's website. "Normally, when we have trouble, Leo helps us out but today the team stepped up," he added. Real coach Lopetegui said it was a "sad day" to lose 1-5 to Barcelona and added that he still had the strength to lead the Club. "We all know how football works and the one who is ultimately responsible is the coach, but there is more to it and we all win and lose together," Lopetegui said. "It’s early in the season and even though today is a sad day Madrid can have a good year. I still have strength to lead the group," he added.